Polish Grandmaster Monika Socko has knocked out Women's World Chess Champion Hou Yifan of China in the second round in Khanty Mansiysk. 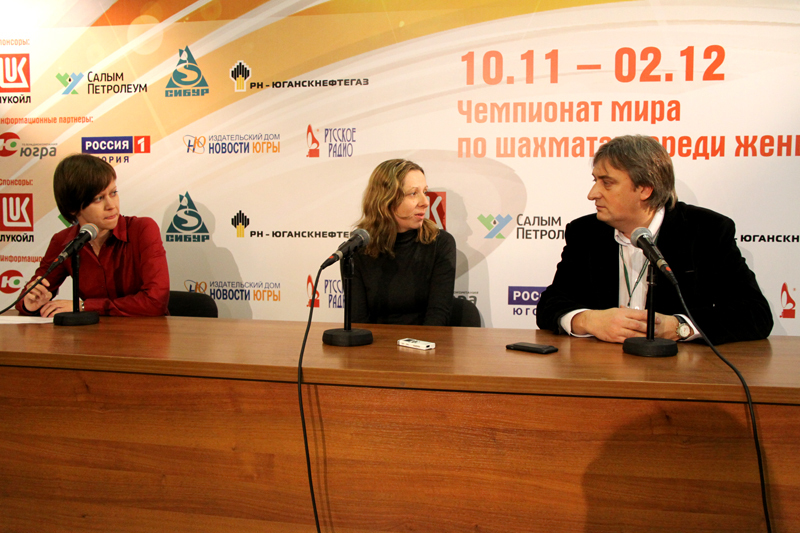 The Polish grandmaster told journalists about her victory against the World Champion: It certainly wasn’t easy. I expected a different line of the Sicilian, but Hou Yifan decided to play 6.Bb5, after which we both were out of book. The last moves I remembered were 5…Nc6 and 6…Nd7. I think 8.b3 is already a bit passive. Maybe she started to play for a draw, which is not always a good idea. My plan was very simple, and soon I had a bishop pair in an open position as well as a strong d-pawn. Q: Hou Yifan usually plays quite actively. Did you feel her hesitation during this game? Maybe she started to play for a draw indeed, and such attitude was the main reason of her defeat? – I was also surprised to see her playing like this. Maybe she simply did not expect the Sicilian and prepared for the French. I wasn’t sure about my opening choice until the very end, but fortunately made the right decision. This is my first victory against the World Champion in a classical game. Before that I could only beat her in rapid chess, and in classical chess I made two draws and lost a few times. Players proceeding to Round 3 include: Monika Socko, Antoaneta Stefanova, Marie Sebag, Valentina Gunina, Nino Khurtsidze, Lela Javakashvili, Tatiana Kosintseva, Nadezhda Kosintseva, Natalia Pogonina, Anna Ushenina, Huang Qian, Irina Krush, Ju Wenjun and Natalia Zhukova. It's just one of the most shocking World Chess Championship result to have all the top stars eliminated from Hou Yifan, Alexandra Kosteniuk, Anna Muzychuk, Kateryna Lahno, Humpy Koneru and Valentina Gunina. I am surprised for sure.